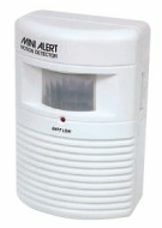 The Mini Alert Alarm uses passive infrared technology to protect a room from intruders. Producing an infrared triangle, the Mini Alert creates an unseen barrier that's impossible to penetrate without setting off the alarm! Battery operated, the Mini Alert needs no wiring and can be easily moved to a new location. Alarm or Chime mode. Mounting bracket included. Requires three AA batteries. Simply open the battery door at the bottom, insert 3 'AA" size or (UM3) batteries as indicated by the internal marking, then close the battery door.